Featuring new and updated information on computer technologies, including networking and using the Internet as a necessary tool for professionals, Human Services Technology: Understanding, Designing, and Implementing Computer and Internet Applications in the Social Services will help individual human service professionals and agencies understand, design, implement, and manage computer and Internet applications. Combining several relevant fields, this informative guide provides you with the knowledge to effectively collect, store, manipulate, and communicate information to better serve clients and successfully manage human service agencies. 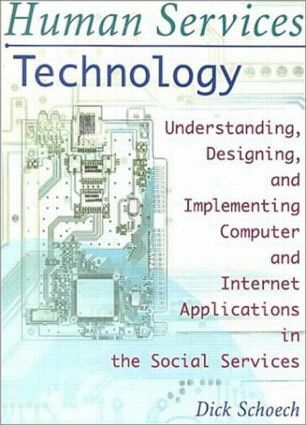 Human Services Technology explains basic technological terms and gives you the history of technology uses before you explore other areas of Information Technology (IT). This essential guide will also improve your ability to find and understand recent research and information on important topics. Containing dozens of graphs, tables, and figures, this knowledgeable book will help you with any IT problem you encounter. Symbols by certain subjects in the book indicate that you can find more information and references on that issue through links on the book?s accompanying Web site. Human Services Technology will enable you to thoroughly understand and use IT to help you offer improved services to clients and manage agencies with increased efficiency and effectiveness.